However and by whomever the “holey” donut came about, it remains one of the most popular treats in America. And it’s such a great treat that even our friends who are gluten free or simply trying to cut back on their gluten intake deserve to enjoy them, too! 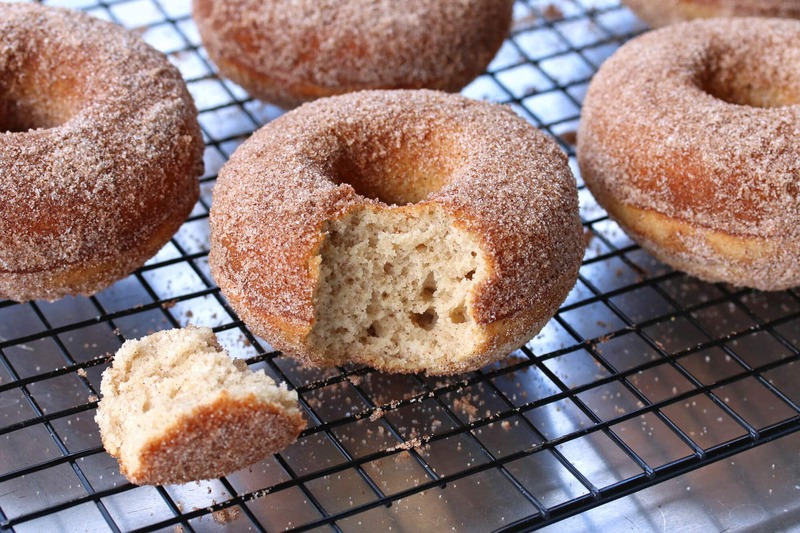 So here’s a gluten free cake donut that’s easy to make and is baked instead of fried. 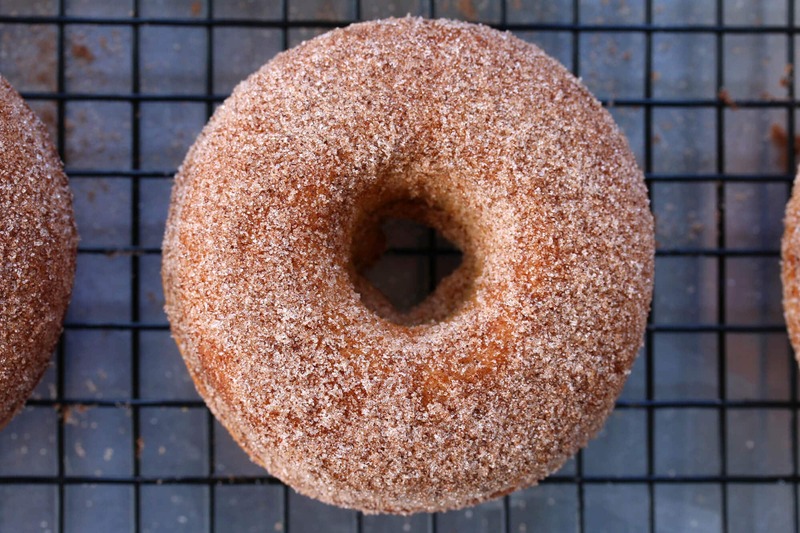 Unlike many gluten free donuts that are heavy and dense, this version has a lighter, fluffier texture and a terrific flavor! Combine the flours, starch, baking powder, baking soda, cinnamon salt and xanthan gum in a bowl. In a separate, larger bowl, beat the butter, oil and sugar until combined, then beat in the eggs and vanilla extract. Alternate beating in half of the milk, then half of the flour mixture followed by the remaining milk and flour mixture. Beat just until combined. Lightly grease a donut pan. I use and like Norpro’s Nonstick Donut Pan. Scoop the batter into the donut molds, filling them to the top. In an oven preheated to 425 degrees F, bake the donuts on the middle rack for 7-8 minutes until golden and a toothpick inserted into the middle comes out clean. Let the donuts remain in the pan for 2 minutes before removing them. 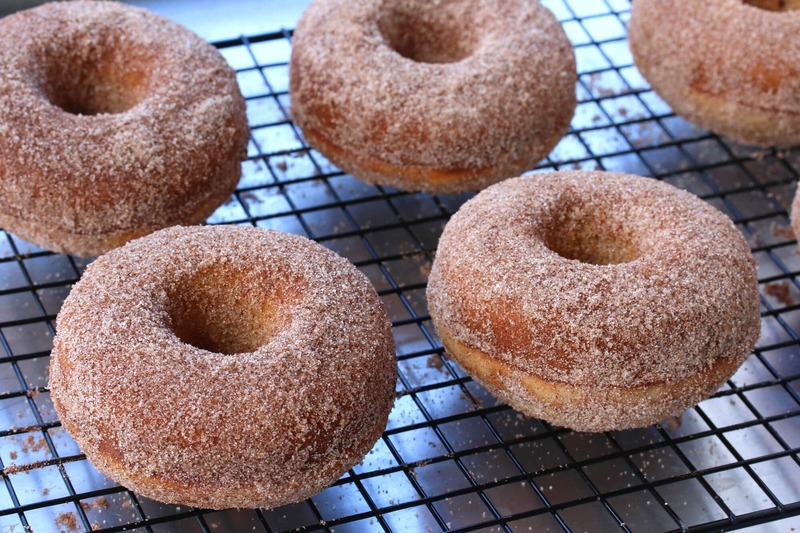 I like to give the donuts a very light spray of oil before I roll them in the cinnamon sugar so that better adheres to the donuts. You can do that while they’re still warm or once they’ve cooled. Place the donuts on a wire rack to cool. 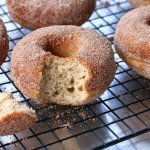 The absolute BEST gluten-free cinnamon donuts! Preheat the oven to 425 F. Lightly grease a donut pan. In a separate, larger bowl, beat the butter, oil and sugars until combined, then beat in the eggs and vanilla extract. Alternate beating in half of the milk, then half of the flour mixture followed by the remaining milk and flour mixture. Beat just until combined. Bake the donuts on the middle rack for 7-8 minutes until golden and a toothpick inserted into the middle comes out clean. Let the donuts remain in the pan for 2 minutes before removing them. I like to give the donuts a very light spray of oil before I roll them in the cinnamon sugar so that better adheres to the donuts. You can do that while they're still warm or once they've cooled. I know so many people who’d adore these donuts, including myself! Doughnuts are one of our favorite weekend treats. 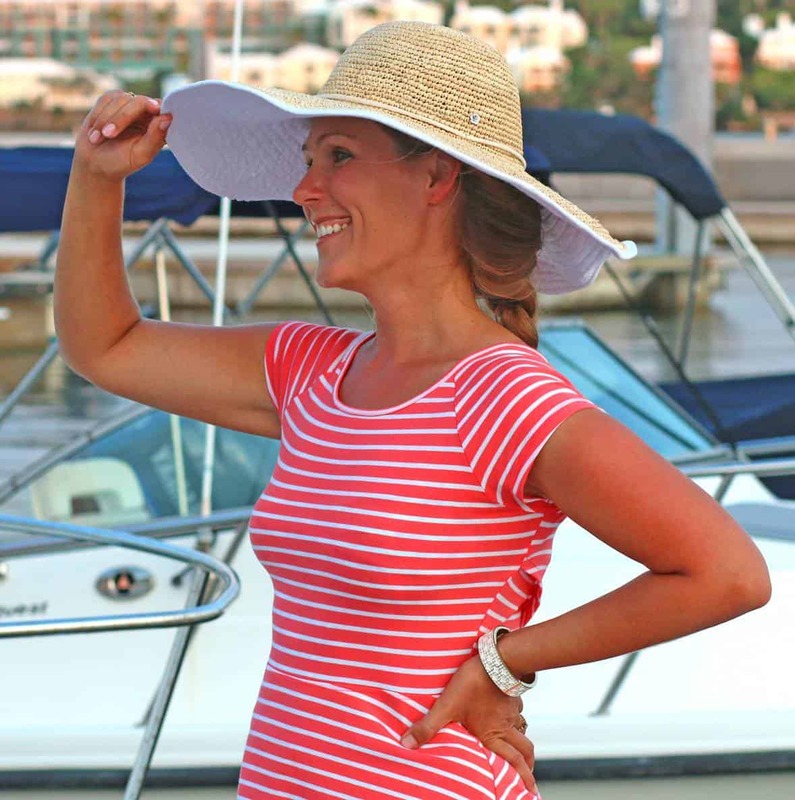 Adding these to the list! Believe it or not I’ve never made donuts at home! Gotta try these! It’s always fun to learn a little food history! I’ve never tried making donuts before, but I’ve thought about it. Think it might be time to give it a try! 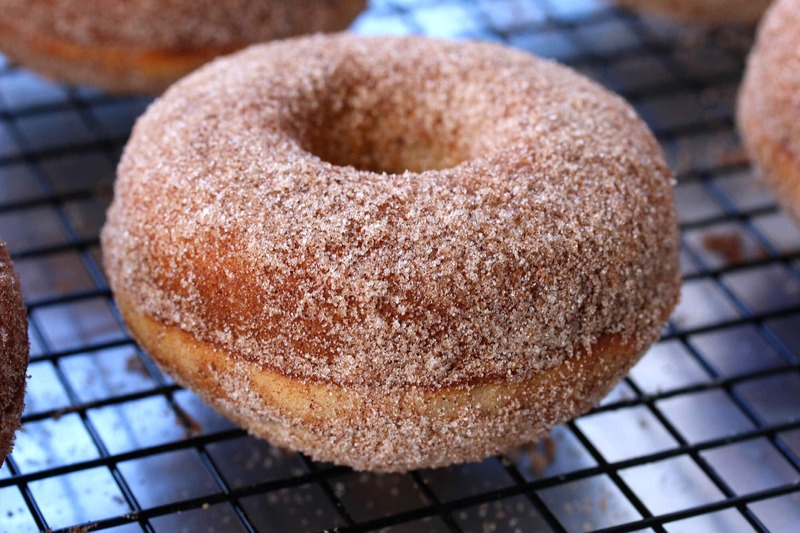 I love making donuts for my kids on the weekends but we’ve never done a cinnamon sugar one. Definitely trying these this weekend. Thanks! I love donuts! These look like they have the perfect texture! My gluten-free sis-in-law is totally going to love this recipe! These look SO good!! My family would LOVE these!! Watch out donut shops! We are moving in with these donuts! They sound amazing! These donuts look so fluffy and delicious! I should make a batch this weekend! I love the doughnut food history!!! I want to pull my donut pan out right now! I’m craving these right now! They look amazing! Loved reading the history of doughnuts. Who knew?! 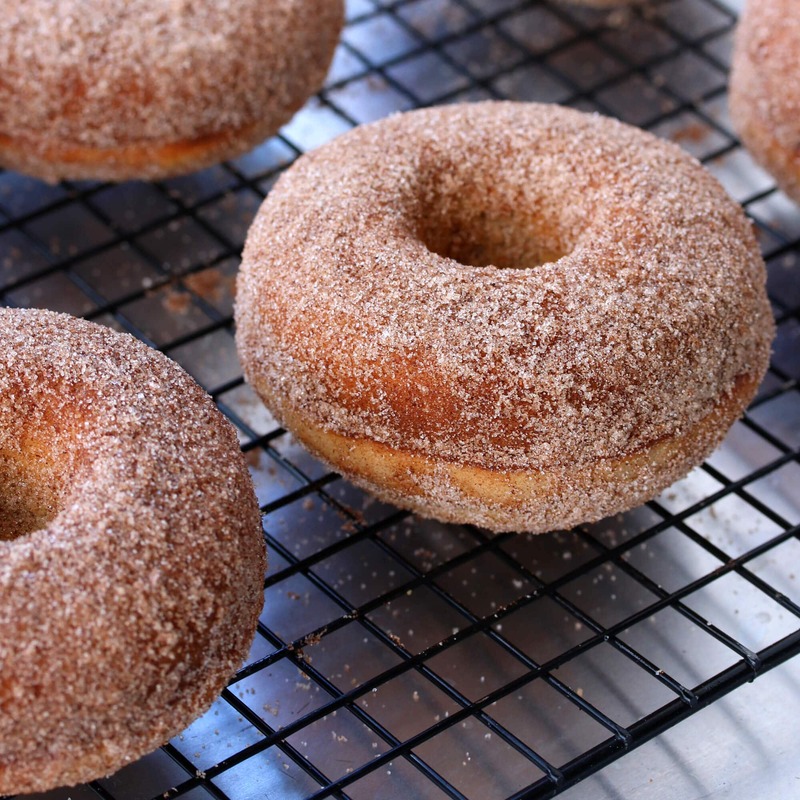 A simple cinnamon sugar doughnut is one of my favorites and these look so good! Question: Can I make these with regular all-purpose flour? Hi Guy, I haven’t tried this particular version with AP flour so I’m not sure how a direct substitution will impact the texture. If you try it, it would be 2 1/2 cups of AP flour and omit the xanthan gum. Again, it may need some additional adjustments in the amount of oil or liquids, I’m not sure. If you try it, let us know how it turns out!